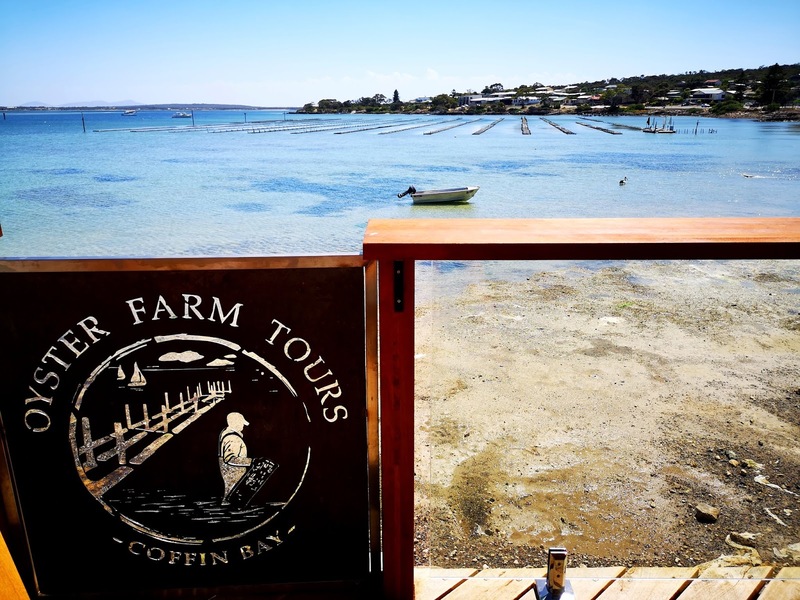 Of the many bays of crystalline blue waters and golden sands which line the Eyre Peninsula, Coffin Bay boasts the most ideal conditions for farming the Pacific oyster. The closed bay system and water temperatures allow the shellfish to thrive, and exports from the region are considered to be some of the best in the world. 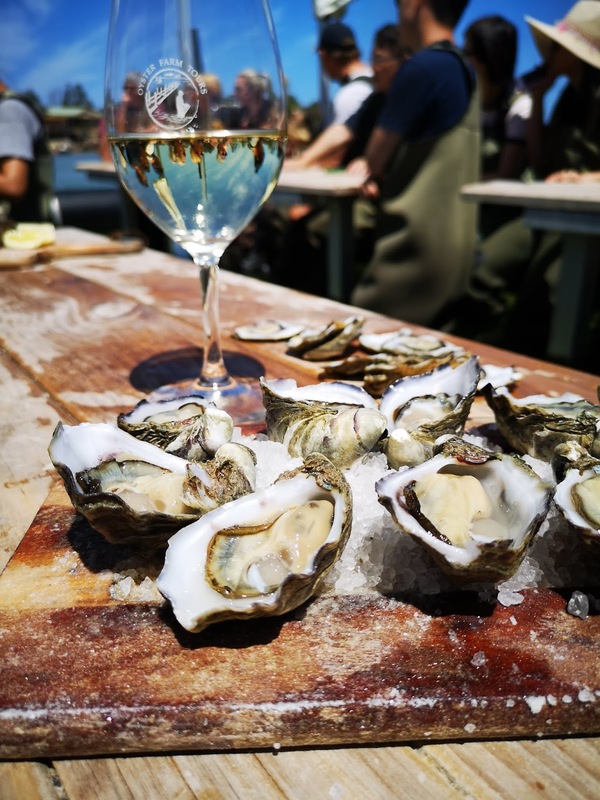 While many of us may have enjoyed slurping down an oyster or two, it is rare to have the opportunity to be able to go directly to the source and taste them at their freshest. 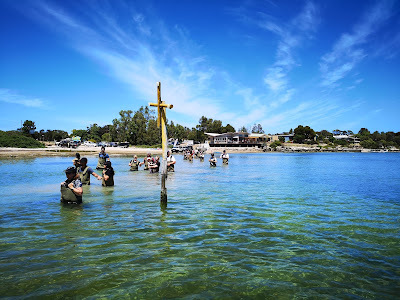 Ben Catterall, a local resident of Coffin Bay and farm lease holder for Coffin Bay Oyster Farm, wanted enthusiasts to be able to experience their oysters plucked straight from the sea. He started by taking small groups to stand on the water covered walkway leading to the baskets, but a large amount of interest in the tours has led to the addition of an exciting new expansion, which includes a floating dining pontoon and oceanfront café. Ben worked on the build himself and his familiarity with the small cove, his lease is located in, has helped the building to blend seamlessly into the oceanfront. A modern wooden deck is decorated with locally-made ironwork panels and large glass windows open into the expansive vista of sunshine and water. After checking in with Kim at the front desk we wiggle and wobble our way into our waders. While the waders do keep out the majority of the water, it is advisable to keep electronics and valuables behind the desk in reception or above chest height, as you may need to be prepared for a rather damp rear-end! Rather than walking along the beach, Ben encourages us to leap into the shallow waters and wade our way across to the farming floats (a good test for the waders!). Long benches line either side of the dining pontoon just under the waterline and we sit in the refreshing water with our feet dangling beneath us. The tour comes with a number of options for upgrades and we have indulgently booked for an extra dozen oysters and glass of wine each. The oysters are perched on piles of rock salt which has been spilled across rustic timber platters, and they are freshly shucked in front of us as we settle into our seats. While champagne and beers are on the menu, we went with the Stump Jump Riesling from d'Arenberg. Fresh and aromatic, the sweet and delicate zing of citrus and white flowers pairs wonderfully with the salty tang of the fresh oysters. As small silver fish dart between my boots and the sunshine warms the bare wooden planks of the shared tables, I (Dani) am definitely in a happy place. Cheerfully slurping away, we listen as Ben explains the history of the bay and the farming processes of the area. 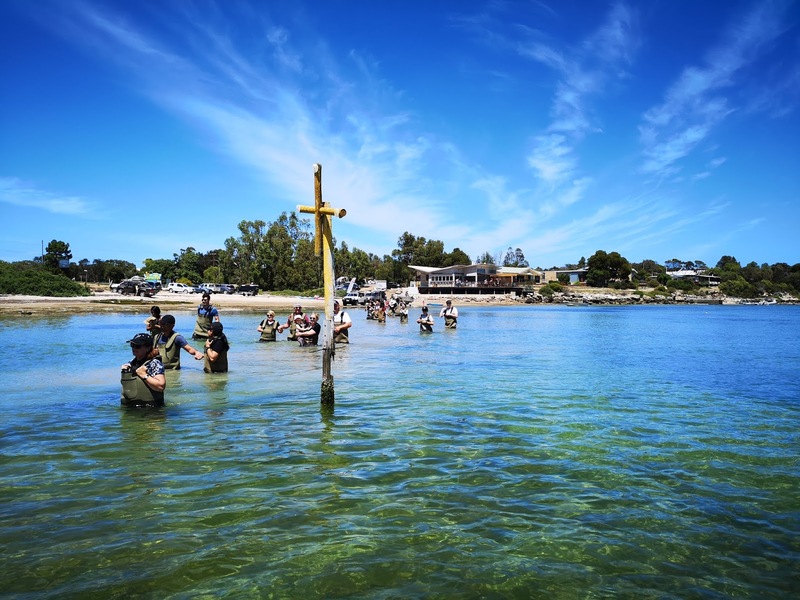 Coffin Bay produces two kinds of oysters - the native Angasi oysters and Pacific oysters, which were introduced to the region from Japan in 1969. As the Pacific Oysters are naturally larger and reach maturity at 18 months (compared to 4 years for the Angasi) they quickly became the species of choice for farmers, and consumers have been happily gobbling them up from Adelaide to Hong Kong ever since. The crew also provides each tour member with a protective mesh glove and shucker and teaches us how to shuck our own oysters, with mixed results, which range from professional presentation to messy enthusiastic. After a few happy snaps amongst the oyster baskets, we stride back through the ocean and wriggle our way back out of our wet waders. 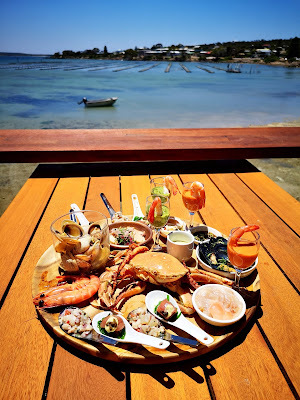 As we are self-confessed seafood addicts, and don’t know when our travels will bring us back across to this region, we have decided to also treat ourselves to the tour upgrade option of having a fresh seafood platter served to us on the deck after our tour. 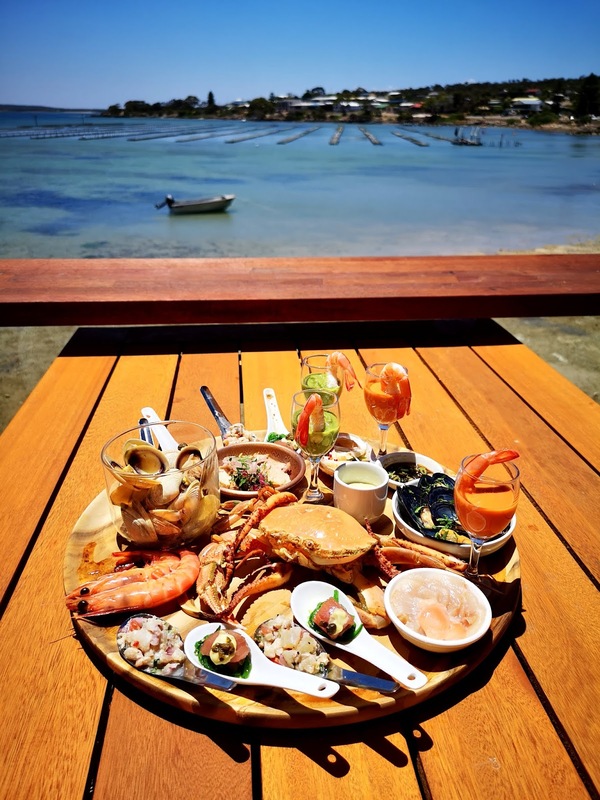 The local Eyre Peninsula produce is stunningly displayed on a large round board and includes blue swimmer crab, Spencer Gulf prawns, kingfish ceviche, pipis, muscles, tuna sashimi and abalone. The café’s drink menu includes a range of local beers and wines and, always keen to support SA, we sip another glass of cool riesling as we relax on the sun-filled deck. 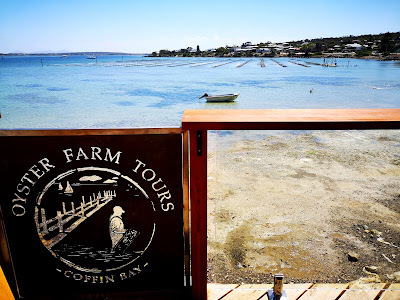 Tours can be very popular in peek seasons, so I would recommend booking ahead via the Oyster Farm Tours website to make sure you have a place at the pontoon. 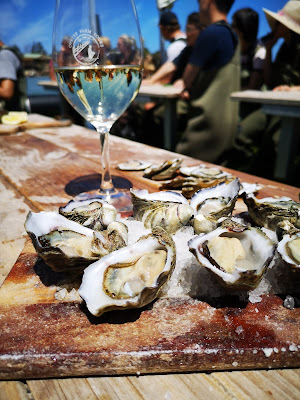 We chose the 'Riesling + Extra Oysters + Seafood Share Plate' tour option for $120 per person, and it was well worth the cost. Coffin Bay National park is also only a short drive away from the township and contains some stunning coastal landscapes if you need to fill in some time before or after your tour.